In April 1966 lifelong Warren Buffett friend Carol Loomis wrote an article in Fortune magazine titled: “The Jones Nobody Keeps Up With“. In the article she introduces Alfred Winslow Jones and Hedge Funds to Fortune readers. She explains that Jones’ 5 year historic IRR (internal rate return) of 33.56% is 7% higher than the best performing mutual fund (Fidelity Trend Fund) while his 10 year historic IRR of 22.64% beats mutual funds’ top performer (Dreyfus Fund) by 6%. 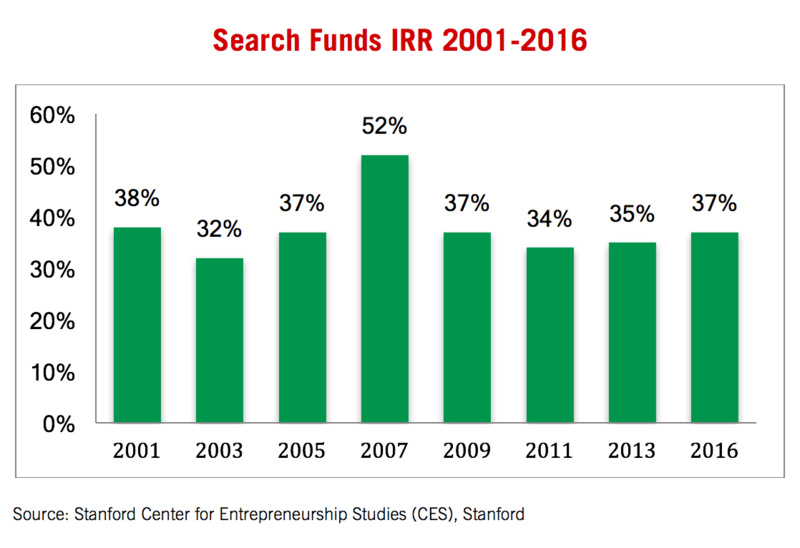 Since 2001 the Center for Entrepreneurship Studies (CES, academic parter of IESE’s Search Fund Center) at Stanford has reported on the performance of investments in search funds and the follow-up acquisitions in North America (a search fund is a pool of capital supporting the efforts of an entrepreneur, or pair of entrepreneurs, in locating a privately held company for the purpose of acquiring, operating, growing and selling it). Excluding the 52% IRR in the 2007 study, CES has constantly reported IRRs in the high thirties. IESE’s Search Fund Center, in its recent publication reported IRRs of 33% for international search funds. With this permanent high performance, investments in search funds and their subsequent acquisitions perform very favorably vis-à-vis other alternative asset classes such as hedge funds and real estate as well as when compared to private equity, be it in US, Europe or Pacific Rim. The only asset class that performs similarly in terms of returns is US venture capital, arguably with a much steeper risk profile. When looking at this, one has to wonder: why is this working and will this keep on being the case? My colleague Rob Johnson addressed the former by asking the question to 17 of the largest investors in search funds. The results have been published in a wonderful article: “Search Funds-What has made them work?” In this post I am addressing the question whether the future will hold similar high returns or whether these will be a thing of the past. In trying to predict the future of search funds performance I believe two subject matters are of importance: performance patterns and search fund dynamics. The typical performance path in alternative asset classes starts with a group of pioneers discovering inefficiencies. In merger arbitrage this was the mispricing of the relative values of shares involved in M&A vis-à-vis the completion probabilities, while in private equity money would be made through operational, financial or strategic adjustments in the acquired company. Arbitraging out these inefficiencies is what led to performance outliers. These outsized performances however attract attention and more importantly money, lots of money. It is this ‘wall of money’, often combined with a lack of understanding of the intricacies of the strategy that would lead to inflated asset prices and limited investment opportunities, leading to disappointed returns. Smart money and pioneers had moved on while others were pondering whether to cut their losses or hope the ‘good times’ would come back. Now that the attractiveness of search funds investments has been established one could (and probably should) wonder whether it is ‘time to move on’. Before addressing this let’s look at search fund dynamics. West Australian, with Jockey Up & Trainer. West Australian was the first horse to win the Triple Crown in England. 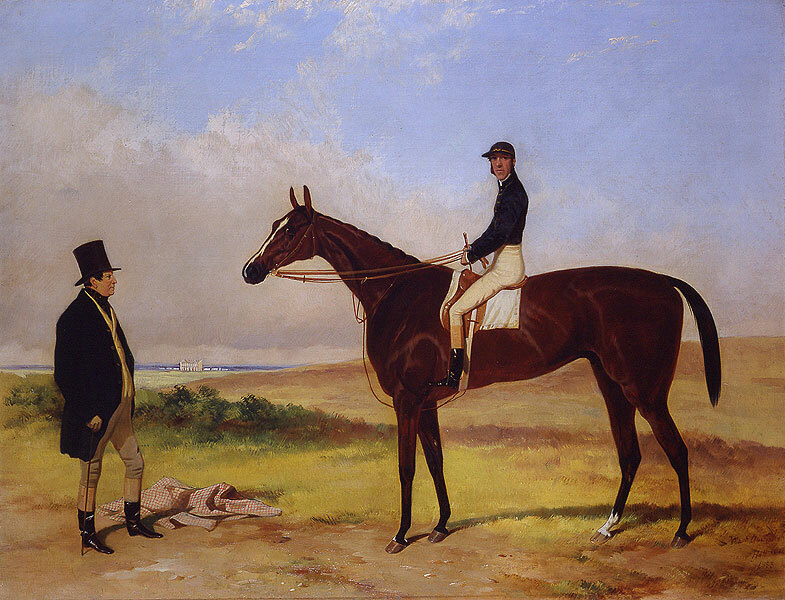 Winner: Derby, 1853 St. Leger, 1853 The Ascot Gold Cup, 1853. Painted by Harry Hall (1816 – 1882). In Rob Johnson’s article the metaphor of horseracing is used -comparing the searcher to the jockey, the investor to the trainer and the company to the horse. It is indeed the personal cooperation between experienced investors and passionate searcher that makes this asset class distinctive and I’d argue successful. As one interviewee states: “Money has faces. It is important who your investors are”. 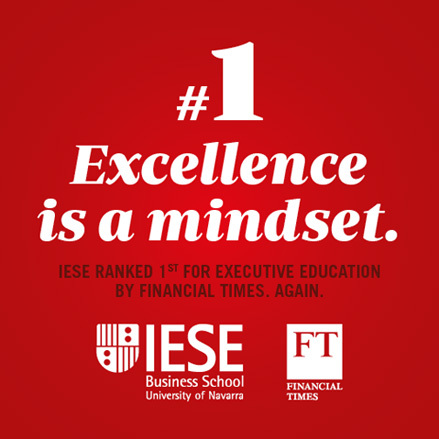 Similar comments could be observed during IESE’s 2nd International Search Funds Conference celebrated recently in Barcelona campus, attended by over 240 searchers and investors from twenty-two countries. It takes a certain kind of investor who finds great joy in assisting a 30-year old in searching, acquiring and growing a micro-company. What does this mean for the future performance of the asset class? The demographic shifts (baby-boomers retiring without succession plans) and the supply of excellent MBAs warrant the continuing increase in searches. If what has made them work is respected, there is no reason why performance should drastically change over the medium term. However, it is true that the returns are starting to be noticed and this at a time that other asset classes have showed subdued performance. This makes me believe that money chasing performance will flow into this asset class too. This will likely lead to a bifurcation of the asset class. On the one hand there will be active investors and smaller funds (like many of the ones in existence today) that together with the young searcher will buy good companies and make them great. On the other hand we will find passive investors, private and institutional, that will only bring money to the fore. While there will probably always be limited room for some passive investors, it will be the active investors that are sought after by searchers. Over time this should mean that passive search funds investors will be second choice and thus will find it impossible to keep up with the active ones. Money, after all, is a commodity indeed. Shareholder Activism: Is Bill Ackman’s shorting of Herbalife a form of Responsible Investing? Single Payments Area: How Does That Affect My Business? Jan Simon teaches capital markets, investments, alternative investments and sports management in IESE's MBA program. Prof. Simon earned his MBA from IESE and his law degree from the Katholieke Universiteit of Leuven, Belgium. He also holds a postgraduate degree in investment advice from EHSAL Brussels, Belgium, and his Ph.D. at the University of Essex, U.K. Thanks to good information presented in this article. Thanks for the great article, this is really helpful. Your article has been further enlightening in addition to all the conversations and reading I have immersed myself in. Thank you for this great article. It would be really interesting to factor in the risk of each asset class. 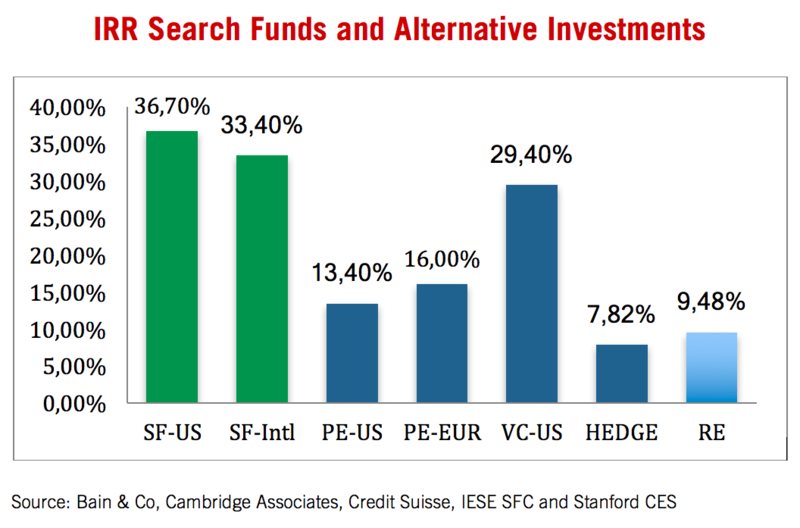 I don´t have clear numbers on it but I would argue that Search Funds have a risk profile much closer to PE than to VC which makes them and even more attractive asset class. It also puts pressure on searchers to follow the model and not try to innovate when selecting target companies. I believe that the growth in number of searchers is outpacing the growth in number of active investors. This could lead to some searchers accepting passive investors which could damage the performace of search funds as an asset class. After all, investors’ advice through the whole process is extremely valuable. Your post when it comes to elegance, it has captured the sense of the readers. You wrote something different than any other of blogs. I want more similar topics about this post in future. Thank you again for all the knowledge you distribute, Good post. Do Keep sharing JAN SIMON ! Underlining the link between energy and geo-politics, Israeli's natural gas fields are bringing it closer to its regional neighbors while the U.S. sends an aircraft carrier to the Persian Gulf.